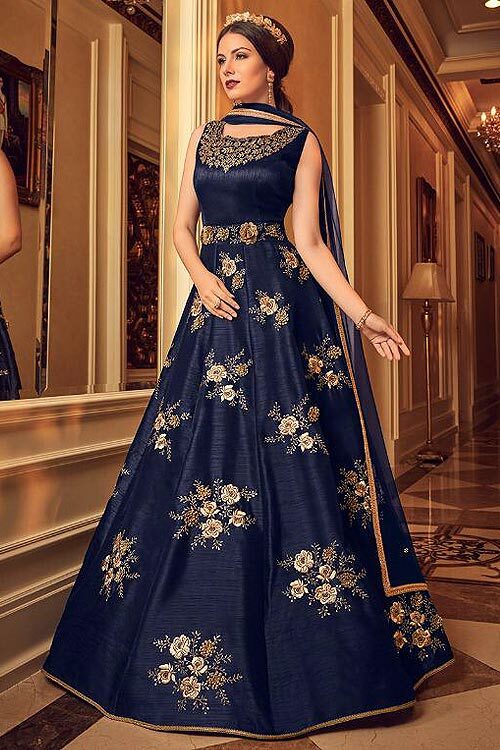 You have added Navy Blue Floor Length Anarkali Suit with Floral Zari Embroidery to your Shopping Bag! Get party ready instantly with this navy blue floor-length anarkali suit! The anarkali kurti is accentuated with rich floral embroidery. The neckline is embellished with delicate zari embroidery while the waistline and the lower panels are accentuated with larger embroidered floral motifs. It comes with matching bottom and a dupatta with golden border. Complete your party look with a golden headgear and a pair of earrings. Apply a little makeup and you are ready for the party!